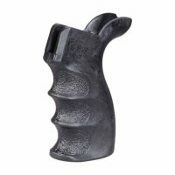 Tactical 3 finger pistol grip for M16/AR15, replaces standard grip in moments. Increases operator comfort and weapon performance, providing more control during firing while reducing fatigue. Finger grooves, palm swell and contoured backstrap allow for a powerful grip. Mottled surface area allows for a secure grip when in use or when wet. Grip base offers an easily accessible secured storage compartment for a small cleaning kit or other items.